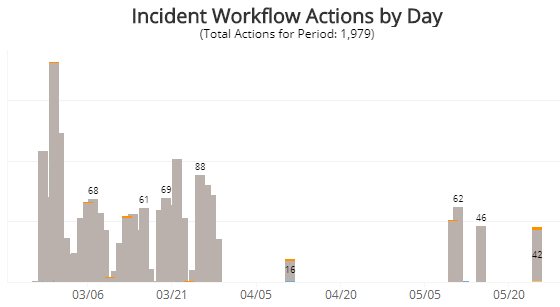 The Incident Workflow Explorer report tracks and evaluates daily workflow actions performed in the Incidents console to determine how often incidents are suppressed from reports, the Incident summary page, and the Security Posture page. In the Alert Logic console, click Reports, and then click Threats. Click Incident Analysis, and then click Incident Workflow Explorer. To refine your findings, you can filter your report by Create Time, Customer Account, and Detection Source. 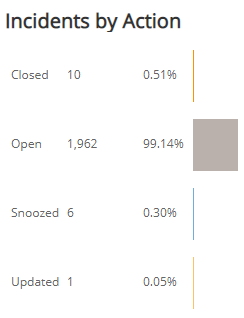 This section provides the counts and percentages of total incidents you closed, open, updated, and snoozed for the filters you selected. The color-coded bar represents the number of times you performed that workflow action in the selected filters. This section displays a stacked histogram chart that displays the total daily workflow actions performed in the selected filters. This section displays a color-coded pie chart with the counts and percentages of the feedback reasons specified when users closed incidents. The data next to the pie chart presents the trend over the selected time period of the feedback reasons those incidents were closed. You can display the data as a line or bar chart. Click the drop-down on the top right of this section, and select the chart type you want to see. This section displays a color-coded pie chart with the counts and percentages of the feedback reasons specified when users updated incidents. The data next to the pie chart presents the trend over the selected time period of the feedback reasons those incidents were updated. You can display the data as a line or bar chart. Click the drop-down on the top right of the Closed Incidents by Reason and Trend section, and select the chart type you want to see.